Carpal tunnel syndrome is caused by a compressed nerve in the wrist that causes symptoms in the hand. Pressure on the median nerve, which is inside a narrow passage in the wrist called the carpal tunnel, causes the nerve to malfunction. This nerve provides feeling to the thumb, index and middle fingers, and half the ring finger. It also controls several muscles in the hand, including the muscle that allows the thumb to touch the little finger. 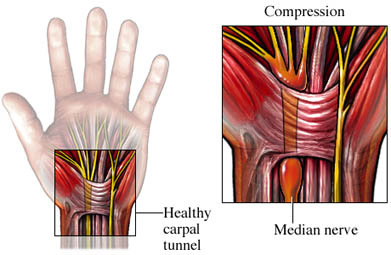 Compression occurs when the tissues in the carpal tunnel swell up. Carpal tunnel syndrome is a repetitive strain injury. Although there are many causes for carpal tunnel syndrome, by far the most common is doing repetitive motions as part of your job. Many experts believe that the increased incidence of carpal tunnel syndrome is due to changes in workplace responsibilities in which one person commonly does a single task over and over again. There are approximately 1 million new cases every year. What are the risk factors for carpal tunnel syndrome?What are some causes of carpal tunnel syndrome?What are the symptoms of carpal tunnel syndrome?How is carpal tunnel syndrome diagnosed?What are the treatments for carpal tunnel syndrome?Are there screening tests for carpal tunnel syndrome?How can I reduce my risk of developing carpal tunnel syndrome?What questions should I ask my doctor?What is it like to live with carpal tunnel syndrome?Where can I get more information about carpal tunnel syndrome? Viera AJ. Management of carpal tunnel syndrome. Am Fam Physician. 2003;68(2):265-272.